There will be fireworks on Calton Hill this Sunday evening at 7pm. 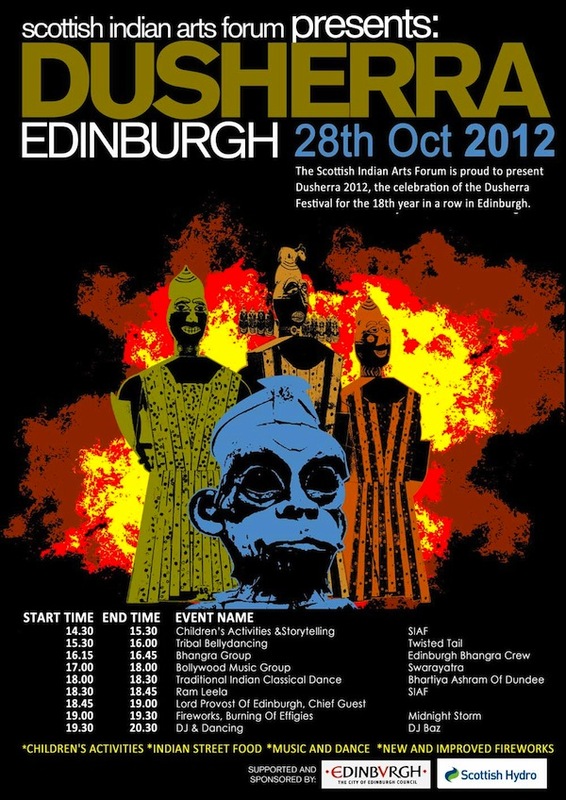 Dusherra will be celebrated for the 18th year running in Edinburgh on the 28th October 2012. Scottish Indian Arts Forum (SIAF) is grateful for the sponsorship and support of The City of Edinburgh Council and Scottish Hydro for this years’ event. The organisers say that they are proud that they have managed to keep the festival free for its visitors. Dusherra 2011 was a change to the format from previous years with the focus shifting from a “low engagement” parade based format to a higher engagement “day out” format incorporating children’s events, music and dance, food and stalls. In addition there will be fireworks and the traditional burning of the effigies of the demons signifying the victory of good over evil. The changed format last year proved very popular with the community and people coming along to the festival, prompting the organisers to stick with the new ‘day-out’ formula for 2012 and the foreseeable future. Dusherra 2012 consolidates the new format on Calton Hill, with an exhibition of electric vehicles from the Scottish Hydro, a rich music, dance and theatre section as well as an expanded fireworks display by the new fireworks partner Midnight Storm. Twisted Tails who are Edinburgh’s favourite tribal belly dancing group and are back for Dusherra by popular demand. They performed for the first time at last year’s festival and put on a fantastic display in their brilliant outfits. They are back again this year with a new routine. Edinburgh Bhangra Crew who are fast becoming one of the favorite Indian performing troupes with a focus on foot-tapping beats on the Dhol drums and dance to present the ever popular Bhangra format in Edinburgh. Dusherra Fireworks and Effigies lighting: Effigies burning is the most traditional aspect of the festival symbolising the victory of good over evil. SIAF is lucky to have inmates of the Saughton Prison, building the effigies of the demons Ravana, his brother Kumbhakarna and son Meghnad. Following the lighting of the effigies there will be a spectacular fireworks display which is historically the most popular portion of Dusherra with thousands of attendees being present on Calton Hill and around the city. Midnight Storm are the new fireworks provider, who are participating in the Dusherra festival for the first time and everyone is looking forward to a spectacular show. After leaving mass at St Mary’s cathedral | was treated to a spectacular fire work display. i had, at the time no idea what this was in aid of , now, after investigation I applaud you and your work and look to the next year. The Next Dusherra Festival is likely to be around 13 October 2013.